New Mover Marketing for Salons and Barbershops • Our Town America, Inc. When a family moves, they're going to shop around for essential services: hair salons and barber shops are no exception. Our New Mover Marketing program has been known to deliver response rates as high as 20% with our partnered businesses! Targeting new movers is an extremely effective way to fight off your competition while keeping new customers coming in! Our proven offers for hair salons and barber shops will get new movers into your shop while they are still getting settled. Nearly every family will establish their loyalty to a new barber or salon following a move. Why not put your shop in front of new customers that are looking for you? Marketing your salon doesn't have to be hard! 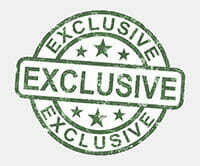 Let our proven offers and new mover marketing expertise increase your established customer base! Want your shop featured in our welcome package? We need a little information and one of our New Mover Marketing Experts will contact you for a free, no obligation market analysis! Each month, your offer arrives to the homes of new movers inside a personalized Welcome Package from the community. Our Welcome Package has been market-tested for over 45 years and proven to attract new customers, get opened, and acted upon. 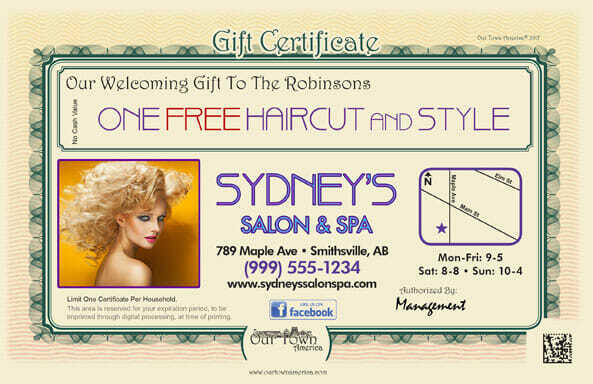 While this particular gift certificate features a Free Haircut & Style, we will work with you to figure out the best proven offer for your salon or barber shop. Everyone knows that finding a replacement for your favorite stylist or barber when you move can be a tough feat! Partner with us to make it easier on the new movers in your area to find your shop! The second mailing is a custom designed, full-color postcard sent out to those who have redeemed your offer. We take care of the design, printing and mailing for you, but what you’d like to present here is your decision! You can send a simple thank you note, offer another discounted service, or even give a free gift. The choice is yours! This full-color postcard is also fully trackable and is a powerful way to get the new mover back into your shop for a second visit! We have the best new mover marketing campaign for hair salons and barber shops and we have the feedback to prove it! Because we only partner with one hair salon or barber shop in any specific zip code, you can lock out your competition. Choose an area as small as one ZIP code or as large as the entire country! Up to 20% of the US population moves each year. New movers spend more because they have no established habits or loyalties. Our unique new mover marketing program makes it possible for you to target a broad audience every single month. Nearly every family will look for a new stylist or barber after they move. Don't lose to your competition. Let our new mover marketing expertise bring new customers to your shop. Contact us today!